Katie Archibald and Dan Bigham both completed hat-tricks of British titles on the final day of the 2017 HSBC UK | National Track Championships in Manchester. Olympic champion Archibald, 24, won the points race to add to her scratch race and individual pursuit titles - in addition to winning silver in the keirin on Saturday. Bigham was part of the Brother NRG Driverplan NRG quartet that won team pursuit gold against 100%ME. The 25-year-old rode alongside Jacob Tipper, Charlie Tanfield and Jonathan Wale as he added to his individual pursuit and kilo crowns. Scottish Development Team won team pursuit bronze with victory over Secret Training.cc. “We literally went out, PB every single lap,” Bigham said. “It's funny, four weeks ago, our first session, we couldn't get three of us across the line! We went hell for leather and just hung on." Team WNT’s Archibald ended the points race on 42 points as one of 11 riders to take a lap. Emily Nelson took silver on 37 with Neah Evans winning bronze on 34. “I'm really pleased with the breadth of experience in racing I've had since Rio,” Archibald said. “Before that we put everything on the side-lines, it was all about team pursuit - I get to express some different interests now and I'm enjoying it!" Jack Carlin, Ryan Owens and Joe Truman proved too strong in the men’s team sprint as they triumphed thanks to three strong rides. Having qualified fastest, they progressed through the semi-finals and then set a time of 44.190 seconds to beat Sportcity Velo’s Joel Partington and brothers Matt and Tom Rotherham, who took silver. Ryan Hutchinson, Alex Joliffe and Lewis Oliva collected bronze with the win over Black Line A.
Owens: "We got better as the day went on. As the format is three rides, you've always got to deliver late in the day - I don't think we expected a time like that in our last ride, coming into it this morning." 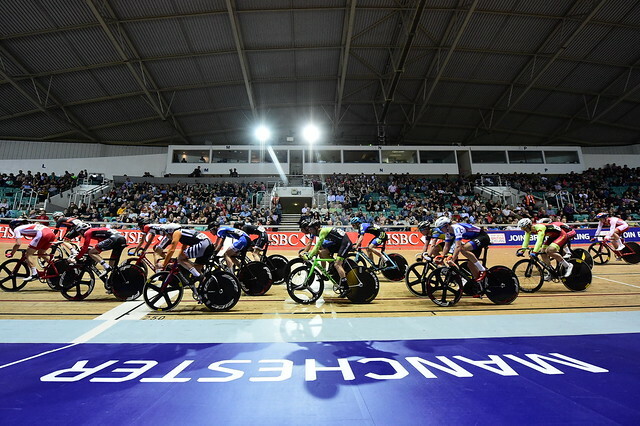 In the women’s tem sprint, keirin champion Sophie Capewell was joined by Lauren Bate-Lowe and the duo won gold for Team Terminator with a dominant display. The duo’s time of 35.037 was too quick for Emma Baird and Lucy Grant of Scotland, who collected silver. Georgia Hilleard and Esme Niblett earned bronze with victory of Lauryn Dawber and Jessica Lee. Lauren Bate-Lowe said: "It was really tough after such a hard weekend but it's so rewarding at the end of it all to get a jersey." Capewell added: "I wasn't expecting much because I was ill last week so everything has been a bonus really and it's just fun to race." Danielle Khan produced a superb final lap to take the 500m time trial title. Having switched to endurance events on the track, the 2013 junior sprint world champion showed she still had explosive speed with a time of 35.495 seconds to push Rachel James into silver position. Sprint champion Jess Crampton won her second medal of the competition by taking bronze. “I knew with my endurance training now that I wouldn't tire so much as when I used to sprint so I just gave it everything to the line,” Khan said. “When I looked up and saw the number one next to my name I couldn't believe it, I really couldn't!" After being denied gold in the final sprint of the points race, Ethan Hayter timed his sprint to perfection to gets his hands on scratch race gold. A tentative 80-lap race came down to a bunch sprint and it was left for Hayter to come around the outside of Frank Longstaff on the final straight. Longstaff took silver with Zach May completing the top three. "It's great to finally have won because I've done four races now and in the others I came third, second and second,” Hayter said. “That final sprint gave me a flashback, I got pipped yesterday but I managed to get around this time."